Architectural Styles and the Design of Network-based Software Architectures, Fielding's doctoral dissertation, describes Representational State Transfer (REST) as a key architectural principle of the World Wide Web, and received a large amount of attention. People now frequently hold up REST as an approach to developing Web services, as an alternative to other distributed-computing specifications such as SOAP. Fielding has also been heavily involved in the development of HTML and Uniform Resource Identifiers. 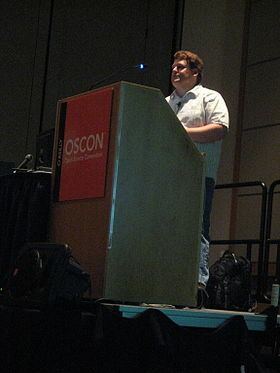 Fielding was a co-founder of the Apache HTTP Server project and was a member of the interim OpenSolaris Boards until he resigned from the community in 2008. He was the chair of the Apache Software Foundation for its first three years and was a member of its board of directors until May 2014. Between 2001 and 2006 Fielding worked on 'Waka, an application protocol intended as "a binary, token-based replacement for HTTP." It was "designed to match the efficiency of the REST architectural style." He works as a Principal Scientist at Adobe Systems in San Jose, California. ^ "A conversation with Roy Fielding about HTTP, REST, WebDAV, JSR 170, and Waka". jonudell.net. 2006-08-25. ^ Roy T. Fielding, Ph.D. (2002-11-19). "waka: A replacement for HTTP" (PPT). This page was last modified on 24 June 2015, at 01:58.